Please join New York City Comptroller Scott Stringer and State Senator Brad Hoylman for a discussion on the future of rent regulation in New York City, featuring Delsenia Glover of Tenants and Neighbors, Sheila Garcia of CASA and Aaron Carr of Housing Rights Initiative. 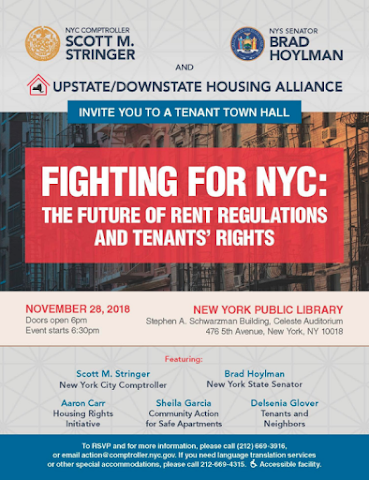 Our speakers will discuss how loopholes and fraud contribute to the ongoing weakening of New York’s rent regulation laws, and how communities across New York City can advocate to repeal Vacancy Decontrol, the Preferential Rent, and the 20 percent Vacancy Bonus in the State Legislature. The deck is stacked against tenants, and it’s time to fight back! Find more info on the Facebook Events page. Over half of NYC rentals are rent stabilized, Section 8, rent controlled, public housing/NYCHA, or Mitchell-Lama. The system has been in place for many decades and does not work to create available affordable housing. Nor does it provide decent housing. Nor does it equitably parcel out who gets what. So don't pretend that a Democratic Party giveaway for your NYC centered votes is going to fix the system either. It is a giveaway in exchange for your votes, an apartment for you or your relative or friend in exchange for your tried and true votes. Isn't that the way it works? Well, it does not work to provide incentives to create low priced housing or a functional rental market. But be sure to listen to all the holier than thou liberal politicians(in this case) paint it as though it isn't. Our landlord doesn't rent stabilized housing to Americans anymore, they all go to transient students and foreigners. There is a war against americans. THAT is why I am NOT THERE as many. as are multi ethnic neighborhoods, communities etc.